In our last post, we learned that nearly one-half of millennial women say that content can enhance their apparel shopping experience. As part of our POPSUGAR Future of Retail Experiences study, we wanted to dive deeper to specifically understand what millennial women want from brands creating branded content. Generally speaking, women seek to make an emotional connection with content and want the content to help them turn inspiration into action in their lives, regardless of the content topic. Therefore, it's not surprising that when it comes to branded content, women are seeking to make a similar connection. Millennial women have a mature understanding of the relationship between brands and branded content and ask that the content that brands create meet the high editorial standards of the publishers they are visiting and that the brands offer content that provides value. 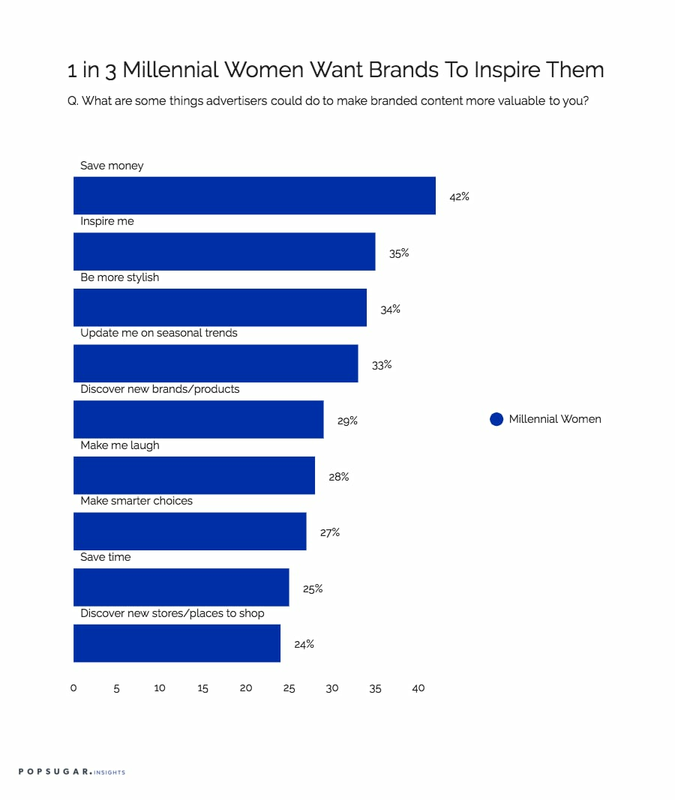 In terms of the specific actions that brands can take to help branded content be more valuable to millennial women, the leading responses include practical options like teaching them how to save more money (42%), helping them discover new products (29%) and make smarter purchasing choices (27%), and helping them discover new/more places to shop (24%). Women also place their trust in brands to help them get inspired (35%), be more stylish (34%), stay up to date on seasonal fashion trends (33%), and save time (25%). Over one in four millennial women are less concerned with information and inspiration and instead want brands to use branded content as a way to make them laugh (28%). Millennial women are perhaps more demanding of branded content and have a higher overall expectation of brands than women overall. Millennial women are more likely to expect brands to provide value in the content they create when compared to women 18 to 49, and brands should make sure that they are delivering true value with the content they develop and distribute.